For the past few years, I have been extolling the excellence of plays presented by the New Jersey Repertory Company in Long Branch. 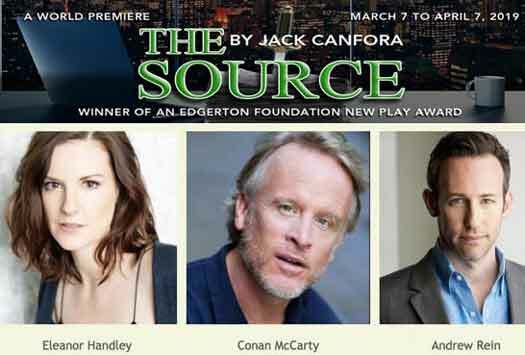 Unfortunately, NJ Rep comes up short with their current production, Jack Canfora’s The Source. This new play is a tedious, thinly-disguised presentation of a real-life media scandal. Roland (Conan McCarty) is a 21st Century media tycoon looking to purchase a large satellite broadcasting company. In a late-night audience with his son Andrew (Andrew Rein) and news division head Eleanor (Eleanor Handley) Roland reveals his concerns about the deal. A two-year-old scandal involving one of his London-based newspapers might cause the British government to block the acquisition. When Eleanor suggests a possible solution, Roland accepts. The remainder of the play deals with the consequences of that solution interspersed with flashbacks to the original scandal. If this all sounds familiar, it should. This is the scandal that caused a downturn in the fortunes of media tycoon Rupert Murdoch. Reporters on his London paper News of the World hacked into the voicemail of a teenage girl who disappeared and was eventually found dead in 2002. News of the World also paid police to gain inside information about the investigation, a practice they defended with an “everyone does it” excuse. The paper’s female editor was promoted to CEO of the newspaper’s parent company in 2009. The paper itself ceased publication in 2011. Murdoch’s plans to purchase satellite broadcaster BSkyB were blocked by Parliament. The Source fictionalizes the phone hacking, the payment of police for inside information, the closing of the newspaper, and the promotion of the editor without adding anything new save a past affair between Eleanor and Andrew. While there is enough heat in the verbal exchanges there is little light generated. Any emotional intensity there might be is generally expressed by increasing the volume of the actors’ line readings. Even the little we see of the affair is passionless. Andrew Rein portrays Andrew as a Cassandra, warning Eleanor against Roland’s manipulations but being dismissed as paranoid due to his father’s constant verbal and mental abuse. Eleanor Handley’s Eleanor is not only cool under pressure, she’s chilly even in her more spontaneous moments. The actress does maintain an accent throughout her performance which is so good one wonders if she really is British. Conan McCarty appears to have been directed to act like a sarcastic old man in a well-tailored suit with a propensity toward shouting. His physical portrayal is less the room-filling presence of a ruthless tycoon than arbitrary movements from spot A to spot B. To be generous, based on previous work by director Evan Bergman it would appear that the play defeated his best efforts as well as those of the actors. As for the technical work, it was up to the fine level shown in other NJ Rep productions. Credit goes to scenic designer Jessica Parks. She skillfully used the depth of the stage to conjure up three different locales over the four years covered by the play. Ultimately, The Source is a play best suited for those who either have forgotten about or have never heard of the scandal that rocked the Murdoch media empire in the past decade. For those who do remember, though, The Source confirms old memories without saying anything fresh about them or revealing anything new. Since I am in the latter group, I find I cannot recommend going to see New Jersey Repertory Company’s production of The Source.